Uralvagonzavod is in the process of creating a new third generation of its Terminator series of tank support vehicles, Rostec Armament cluster industrial director Sergei Abramov has told Sputnik. “Taking into account the experience of the combat use of the Terminator, we are now working on the shape of a new modification of this machine,” Abramov said. Текст на енглеском није потпун. Више детаља на српском, уз велико изненађење везано за калибар топова!!! Uh, to bi onda bio prakticno T-15 sa vise vatrene moci i mozda jos boljom zastitom. Bilo je verovatno na temi o topu. Neka africka zemlja ga je nabavila, pocela isporuka, sasija je od T-90. 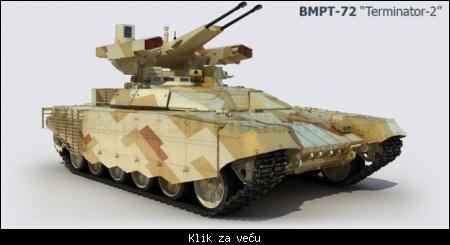 Citat:Uralvagonzavod is developing a BMPT (Terminator-3) with a 57-mm cannon on the Armata chassis. Apparently, there is a debate about whether it should receive two 57-mm cannons like with the BMPT's twin 2A42 30-mm cannons (also on BMP-2). The article notes that 2A42 30-mm rounds repeatedly failed to penetrate buildings in Aleppo and other urban areas, and tanks often had to be called in to use their 125-mm main guns instead. The BMPTs that were tested in Syria also had to use their ATGMs to compensate.